What happens when Apple makes a change or adds a feature to the next iPhone or Macbook? The hold an entire conference. Every publication gets and publishes the details. Can you imagine if they just kept innovating but told no one about the improvements? We probably wouldn’t be on iPhone 11 this year. It works the same with any technology if you want to increase ROI. Anyone who has worked in SaaS knows success in the realm of SaaS is listening to your target audience’s problems and responding quickly and effectively with a valuable solution. The ROI in SaaS is potentially huge with just a few features and changes. Only the companies who do this survive. Even if your product launched years ago, your team still has to keep up and keep providing features and tools that are valuable in an ever changing tech-based business world. Your team is constantly spinning their wheels to create new features, improve your current ones, fix bugs, and release updates to keep up with the new “real time”. It requires a ton of time, money, and talent to keep this machine going. The thing is, so many products are continually improving without anyone using them or their target audience knowing about all the work their team is putting in to bring more value. It’s as if these updates and fixes never even happened and their still working with your initial product. Your ROI is much lower when your updates and new features slip under the radar, which is the opposite of what should be happening as you improve. Without knowing about continual improvements and getting value of them, these products lose their user base. They also miss out on opportunities to attract new users with new features and updates. Now sharing the good news about your new features and any other important changes to your product and company takes less than 10 minutes. With Beamer, creating updates is incredibly easy and you can reach and engage with current and potential users on and off your site and within your app instantaneously. Beamer is an interactive newsfeed and changelog that sits within your product and on your website where your team can announce just about anything: new features, updates, bug fixes, new content, and general news. 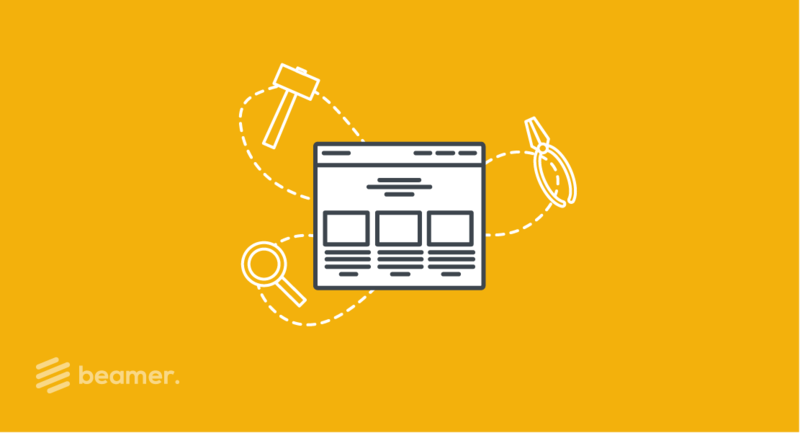 It acts as a central place for users to find news about your product both within your product and on your site. All users have to do is click a “What’s New” tab in your navigation to open up a news feed sidebar with all your updates, new and past. In your app, they can click an icon to open up the sidebar where all your updates live. You don’t need a designer or developer to create engaging and visual posts in Beamer in minutes. Anyone on your team can do it! Beamer is user friendly and you do not need a tech background to use it. It’s easy to add GIFs, screenshots, photos, and videos to your updates for visual posts explaining new features and changes that are easy to understand for your users. You can also include CTA buttons and links to your Beamer posts that go to documentation pages, blogs, or different areas in your product so users can explore new features right away or get more information. It’s much more effective at inspiring action than sending an out-of-context email to your users. When you get in touch with your users more effectively, they engage with your improving product more and they stay on board for the long run. Announcements via other methods you’re likely using now like email or social media just don’t work. Emails to you regular users get a less than 15% open rate best case scenario and a much lower click through rate. Making updates in context right within your app or website is much more effective. Visual explanations are also much more helpful for users to understand and start using new features right away. Most of us are getting more and more used to learning via video and images, including them really helps and increases engagement. You can even get personalized with your updates. Segmentation in Beamer allows you to send your updates to the most relevant users for each to better target and engage them. 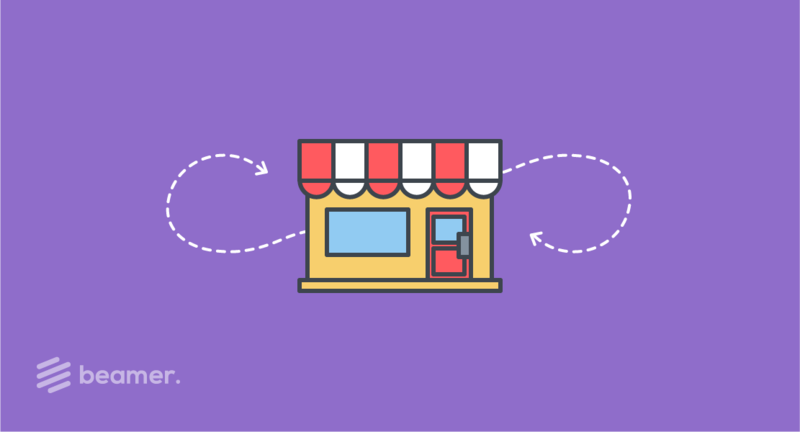 You can segment by demographic, location, language, and past behavior with your product and site. Sending targeted updates you know users will be interested in help you avoid “alert fatigue” as well, so your users don’t start ignoring all your messages. On the backend, your team has access to Beamer analytics where you can quickly see the details of your performance including views, open rates, location, language, and data on each of your active users. Your users can leave feedback and reactions that your team can track to gauge sentiment towards your new features and announcements. 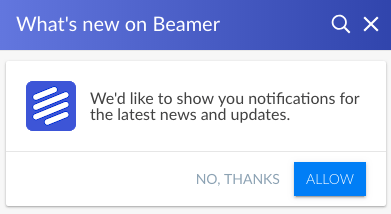 With Beamer, you can reach your users off your site or outside your app with push notifications. Those who have opted in, will receive a push notification when you publish an update. When they click it, it takes them to your site or app with the Beamer feed open on the update so they have all the information right there. This is a great way to bring users back who may be slipping away and keep your regular users in the know and educated on how to get the most value out of your product. Mailpoet, a WordPress email solution, was working hard to consistently improve their product but couldn’t find the time to create announcements that were effective. They found Beamer to be a perfect fit to communicate with their users. Learn more about how they use Beamer to increase ROI. “Beamer has helped increase our upsell numbers 20% since implementation”. Teamleader is a SaaS platform that unifies CRM, project planning and invoicing. Previously, Teamleader had been using a combination of emails, in app messages, and blogs to update users on new features but it wasn’t effective. They found Beamer and now use Beamer to send targeted and language-specific updates for new features to their global user base. Learn more about how Teamleader uses Beamer to increase user engagement and sales. With the amount of time and effort that goes into creating new features and updates, your ROI rides on your ability to get them out, seen, and used by the right people. Without putting a little bit of effort into this, it’s like throwing away the thousands of hours and dollars put into development. 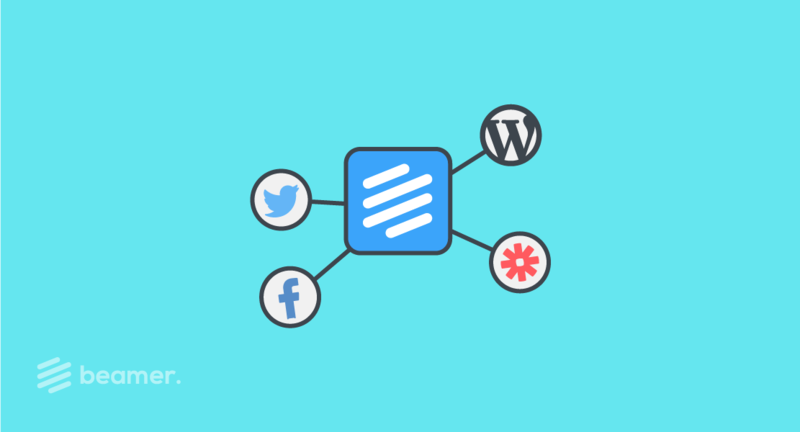 With Beamer, your team needs no more than 10 minutes to get the news out there and your users engaging with your new features for higher ROI. Try Beamer on your site and in your app for a better way to engage your users.